Wireless sensor network (WSN), Insensitive Fuzzy C-Means, Stable Election Protocol(SEP), SEP-Insensitive Fuzzy C-Means. The WSN is a network of interconnected sensor nodes. Sensor nodes are designed compactly and low cost. The nodes are responsible for sensing ambient conditions such as temperature, sound, vibration, humidity, pressure, etc. 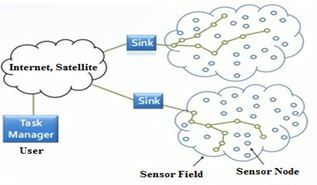 Sensor nodes send their sensed data to the aggregation node and transmit data to Sink (transceiver). As shown in Figure 1, Sink is transmitted over the internet or satellite to the user. In this process, we see that the CH (Cluster Head) not only listen to the signals from the nodes not also synthesize data, then transmit data on Sink so that more energy is consumed, so the routing, specifying the path of this data stream is very important. The routing protocols are divided into two types that are homogeneous and heterogeneous. Homogeneous routing protocols are nodes with the same energy level as the protocols: LEACH, TEEN, HEED, PEGASIS, APTEEN. The heterogeneous protocol is a protocol where nodes have different energy levels and are divided into two node types: the Advance node and the Normal node. In that, the Advance node has more energy and the probability of becoming a node is more than the remaining node. Popular protocols in this type of protocol are SEP[1-5], DEEC, EDEEC. SEP protocol consider the energy levels in the CH selection process and improves the stability of the hierarchical clustering process using characteristic parameters of heterogeneity, adding energy between the advance node and the normal node. In order to prolong the stabilization time, SEP strives to maintain limited energy consumption. The advance nodes will become CH more than normal nodes and will be powered more than normal nodes. However, the selection of Cluster Head in the SEP protocol has a disadvantage which from the two types of node Advance node and Normal node is not flexible, therefore, that remote nodes will die first. To solve this problem, We conducted the our research about SEP and evaluated some well-known clustering algorithms such as K-Means, Fuzzy C-Means, Insensitive Fuzzy C-Means in WSN clustering. Based on the learning theory, We propose a new approach which combines the Insensitive Fuzzy C-Means algorithm into the SEP protocol which can make the WSN network more energy efficient. Additionally, we used Matlab to simulate for the new algorithm, for 140 nodes in a network 500×500, with uneven energy between nodes to show unequal influence among nodes in the network. 10% of the nodes have 1 Joule energy and 90% of nodes have 0.5 Joules energy. The position of the sink is set at (250,250) and the length of each message is 500bytes. The simulation results show that the proposed SEP-εFCM protocol performed better than the conventional SEP protocol. Our paper consists of five parts: Part 1 is introduction, Part 2 shows the related works, Part 3 proposal, Part 4 simulation results and Final Part is the conclusion.